Does death end life, or is it the passage from one stage of life to another? 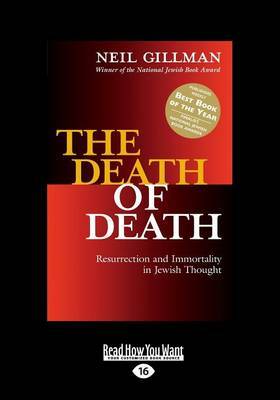 In The Death of Death, noted theologian Neil Gillman offers readers an original and compelling argument that Judaism, a religion often thought to pay little attention to the afterlife, not only presents us with rich ideas on this subject-but delivers a deathblow to death itself. Combining astute scholarship with keen historical, theological and liturgical insights, Gillman outlines the evolution of Jewish thought about bodily resurrection and spiritual immortality. Beginning with the near - silence of the Bible on the afterlife, he traces the development of these two doctrines through Jewish history. He also describes why today, somewhat surprisingly, more contemporary Jewish scholars - including Gillman - have unabashedly reaffirmed the notion of bodily resurrection. In this innovative and personal synthesis, Gillman creates a strikingly modern statement on resurrection and immortality. The Death of Death gives new and fascinating life to an ancient debate. This new work is an intellectual and spiritual milestone for all of us interested in the meaning of life, as well as the meaning of death.